We offer a wide range of concrete security barriers to purchase at fantastic value for many uses such as to control vehicle access, improve site security, protect vacant property and land, block gateway entrances, sign post bases, ballast weights and laden brake testing are just some of the uses by our clients. We make the whole process easy to buy Polysafe concrete barriers and blocks. One-off price - pay and go. Value for money - the more you use your concrete barrier, the cheaper it becomes per use. 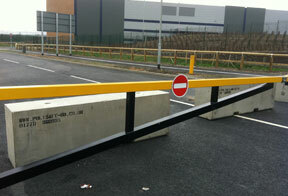 Concrete barriers can be used for many different projects - especially if you have a selection of sizes. Tough enough to be moved and stored - and used over and over.